The breed was developed in the 1930s by breeding a walnut brown female from Burma to local Siamese cats and then selecting the solid dark brown offspring. The most common color is still sable-a deep brown. Other acceptable colors are champagne-a honey beige, blue-grey with a mauve undertone, and platinum- pale silvery blue. Pictured here, left to right, are champagne, blue, and sable. 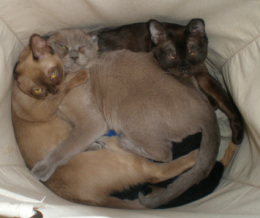 Related cats called European Burmese in the Cat Fanciers Association added additional colors and patterns. The Burmese is also the parent breed for the Bombay, Tonkinese, and Burmilla. 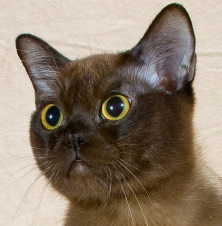 Burmese are “people” cats who require affection and rule the house with a velvet paw. They can be quite vocal with a soft chirping voice. Active even in to old age they love to play with a paper bag or ball and can sometimes learn to fetch. Also known as Velcro cats, the Burmese seeks a lap like a heat seeking missile. If you are owned by a Burmese you can expect them to participate in all sedentary activities-reading, watching TV, computer work, and eating. They are generally healthy and easy to care for and often live into the late teens. The somewhat pug face predisposes them to snoring, sneezing, and eye discharge but this usually does not represent illness. The Burmese head type is round when viewed from front or side. The muzzle varies from square to gently tapered. The body is not large but broad and stocky making them surprisingly heavy for their size. The coat is silky and close lying. It requires little grooming other than daily petting. Eyes are large and round, set wide on the face. The color is yellow to gold.